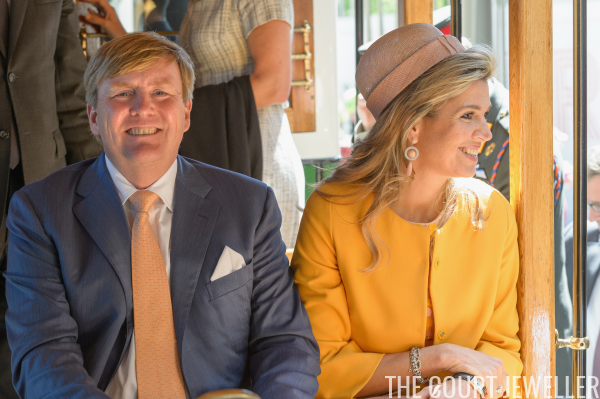 King Willem-Alexander and Queen Maxima of the Netherlands traveled to Christchurch for the second day of their state visit to New Zealand on Tuesday. Here's a look at Maxima's jewelry for the day. Maxima also repeated the same diamond bracelets and diamond ring that she wore during yesterday's daytime and evening events in Wellington. We got an excellent look at her ring and bracelets during one event from today in particular: a visit to Willowbank Wildlife Reserve, where both royals got to (had to?) pet one of New Zealand's most important national symbols, a Kiwi.